As authorities in website development, SEO, content marketing, and digital advertising, we can make that happen. For 17 years, we've helped companies like these achieve their goals. "BKMedia Group were wonderful to work with on our website re-design project. Their staff are great to work with, easy to communicate with and responsive to questions. Plus our new website turned out amazing. Can't say enough great things about our experience with BK!" "Working with BKMedia Group on web development and SEO is a dream come true. They are responsive, creative problem solvers and their design work is excellent. Plus, very cool offices too!" "I've been in the marketing field for close to a decade, and in that time, I've tried more than my fair share of vendors. Today, I rely on BK exclusively for all my needs in the areas of web design and development, SEO (including content development), conversion rate optimization (CRO) and all things related to social media." In today's competitive digital marketplace, just having a website isn't enough. BKMedia Group delivers the ultimate user experience through customized web development and enhanced search exposure. What does our user-driven strategy mean for you and your organization? Increased traffic. Increased leads. Increased conversions. Increased sales. Your business wasn't created from a template — your digital presence shouldn't be either. A poorly planned site can do your business more harm than no site at all. If your site users can’t find the information they need at a glance, frustration can push them into the arms of your competition. We take a data-driven approach to uncover what your visitors need, and develop a site design that keeps user experience top-of-mind. The health of your website and business depends on its ability to speak to your ideal audience. But just having a website doesn't develop or nurture that relationship. We help you develop a cohesive brand and consistent voice that authentically represents your business. With that voice, we carry your message across a variety of channels — from site copy to social media to email marketing — to find and speak to your ideal audience. No matter how incredible your website is, you need a way for users to stop by and see what you’ve got to offer. But not just any traffic will help. Driving the right traffic to your website — the people who need what you've got — is a science. We vet your traffic and attract the right audience to your site, sending positive signals to search engines and boosting your business’s search visibility. From sales to leads to a simple form submission, every website has an ideal conversion rate. Our goal is to lead your users through actions that benefit your business with every visit. We start by analyzing conversion points on your website to uncover any road-blocks that are keeping your users from converting. From here, we move to a strategic approach to bring you even more revenue — from surveys to user testing, A/B testing to total page redesigns. Your website should be a powerful tool for sales, lead generation and more. But you'll never know how this digital machine drives your business until you start tracking the right data and metrics. Whether we're creating sales funnels to track users through a buying process, designing squeeze pages to convert customers from a custom campaign, or A/B testing your homepage, our goal is to understand how people use your site. By gaining insight into what works and what doesn't, we can make strategic changes to improve your site's performance and make it do more work for you. Adding fresh, interesting and well-written content to your site is a valuable tactics YOU can utilize to boost your site's visibility and search engine rankings. Your blog is the perfect place for new content, but if you're not experienced you may be wasting time and effort by making crucial mistakes! 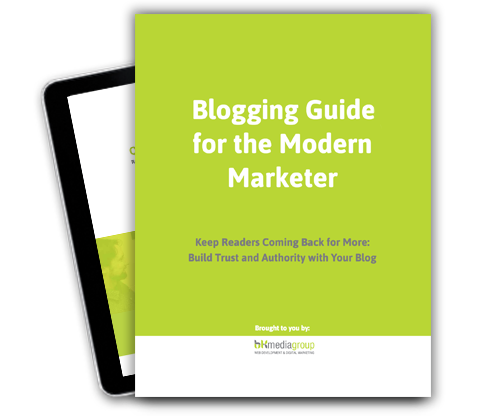 Our Blogging Guide for the Modern Marketer will will give you insight into crafting great content to benefit your site and your visitors!